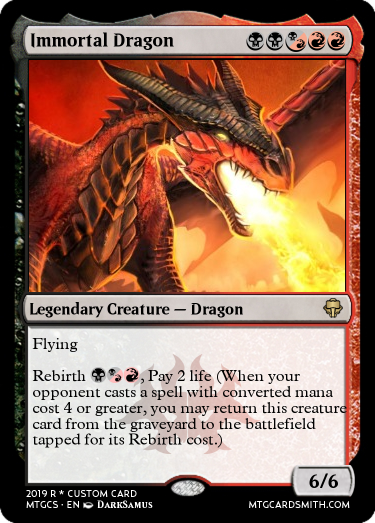 This contest challenges participants to make a creature card that has a 'Rebirth' ability. The 'Rebirth' ability is all about when you play a certain mana cost card, it returns it to the battlefield tapped. 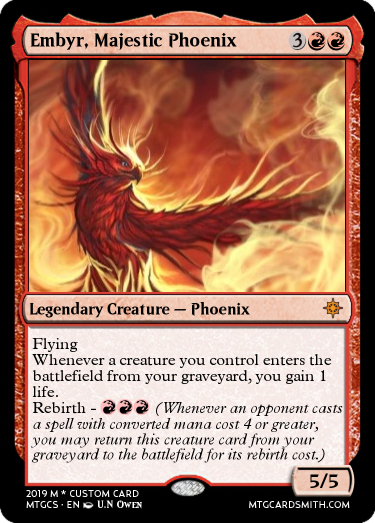 See Ember Phoenix (below) for more information. 1: You must make a new creature card with the 'Rebirth' ability, and it must be a Phoenix, a Dragon, or a Chimera. 2: You can only enter a max of 2 cards. 3: You may edit your card before the due date (March 15, 2019). 5th place earns a follow. So hey, I totally forgot how to post cards so they are not a link, but a picture. help please? I have now placed the rules and deadline. As it says, the deadline is February 18, 2019. Is Ash Rebirth a keyword ability or ability word?? It seems like a keyword to me. Ability words don't have numbers like that. It's a little weird because if the number increases, the effect becomes narrower. I think bigger number should mean better effect. Can I fix that mechanic like this? Sure! I'll edit the contest and it'll just be rebirth. That's cool but it might cause color pie issue. You can put out mono red phoenix from your UB surveil deck's graveyard. That's why my suggestion says "that shares a color with this card". Other way to fix it is "you may cast it from your graveyard until end of turn" so that it lets you pay mana cost of that creature's color. And technically, it doesn't need to say "if this card is in your graveyard" if it says "return it from your graveyard to the battlefield". And it doesn't need "tapped" unless the card is black. Sorry for nit picking.. maybe it would be more fun if participants can make their own version of rebirth mechanic. Plus, it says when your opponent does it, not when you do it. Oh, I misread that part sorry. Thanks, Togimon. I love being the start of one of these contests! It's so fun to see what cool cards people make when given a challenge! I like your idea for the rebirth ability remake. How do you put a card picture on so it shows it instead of sending a link? So, um, there are only three entries, so I'm gonna move the due date to March 15.
there just aren't enough entries. 1) It's triggered by an opponent's action. 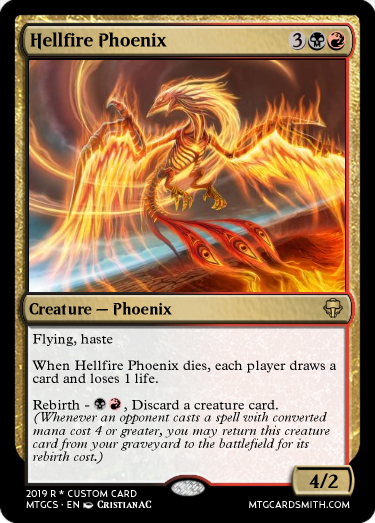 If they know you can return a powerful creature (Phoenix, Dragon, Chimera are usually powerful) from your graveyard, they can choose not to cast cards with converted mana cost 4 or greater. 2) The cmc cap feels high. If an opponent's deck doesn't have so many cards with cmc 4 or greater, the ability would become useless.